It only seemed natural to have a blog feature on a family member. My sister Nancy is Katz's Kreations......that is Katz like in Gates, not Cats. First I'll give you a little history about Nancy. Even as a young child she was very talented in many different fields. Growing up she was a ballet dancer and also excelled in Gymnastics and competed regionally through her high school and also through a private gym. Also in her high school years she was a half time dancer and participated in all the high school musicals. She especially loved her drama classes and started to think about Choreography. By the time of her senior year she was co-choreographer for the high school musical "Mame". During her college years she was a Baystate Bombadier Cheerleader. Baystate Bombadiers were a farm team for the Boston Celtics. Her love for the stage continued through college when she got her first starring role as Sandy in "Grease". After college Nancy took a break from her theatre to raise her beautiful Daughter but never left her heart. She started performing in local community theatres beginning with her role as Grace Farrell in "Annie". She was also in the cast of "A Christmas Carol" for 3 years in the late 90's for the North Shore Music Theatre where she currently works. Today she is actively choreographing and has been for the last 15 years. 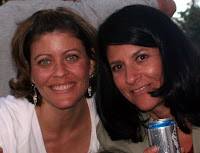 Below is a photo of Nancy and I.....me being on the right. Nancy's creativity didn't stop with just the theater. She discovered that she loved making jewelry. She started off making items for herself and enjoying this as a hobby. Little by little family and friends requested items and she decided to make a small business because her inventory was growing. 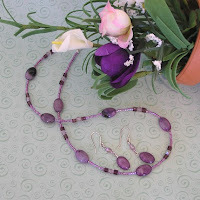 Her workmanship is impeccable and I feel her items are very different and unique. She learned about Etsy in her travels and introduced it to me. We've both been on this journey through Etsy together. Nancy is growing in her creativity. She is branching out in her shop by selling Candle Tealight Holders. 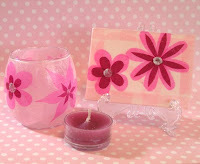 She is designing her tealight holders with the process of Decoupage and also as a bonus, a matching ACEO. 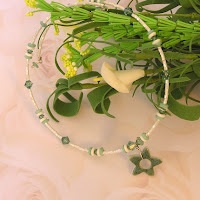 Please visit Nancy at KatzsKreation and discover all the beautiful pieces of handkrafted original OOAK items.